This bracket has two arms allowing the dynamo light to be conveniently mounted to the center of the handlebar. Fits 25.4 to 31.8mm handlebars. It is also suitable for E-Bikes. 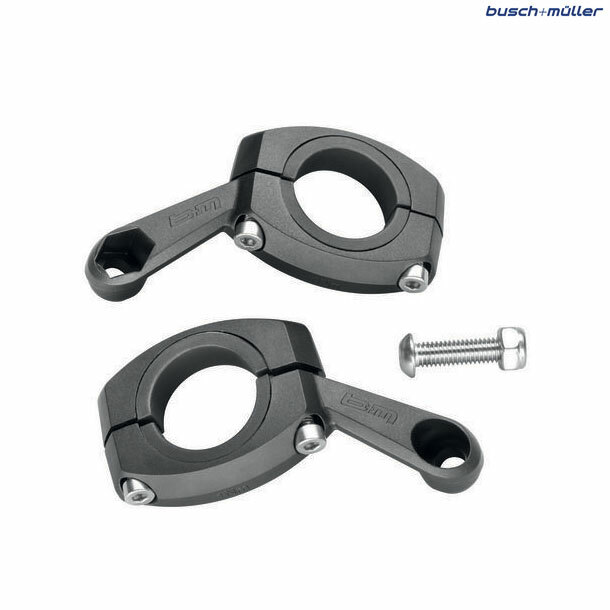 The top clamps of the holder can be bought together to be replaced by the holder of the Bosch board computer. The mount itself comes apart so there is no need to remove anything from the handlebars. if not could you reccomend a suitable light bracket, I am unable to mount onto carbon forks or fork bridge. As we do not stock your light we would have no way of knowing Im afraid. Will the Luxos U Lumotec IQ2 fit this bracket? Thanks. You should be able to fit this without a problem, however we have not tried this so we cannot say for certain.